With so many digital curriculum tools available, it can be difficult to understand the advantages and disadvantages of each program. Here are three reasons why TenMarks Math stands out. 1. TenMarks Math provides best-in-class content built for the depth and rigor of the Common Core and individual state standards. TenMarks Math provides comprehensive, web-based math curriculum resources built from the ground up to align with Common Core and state standards. 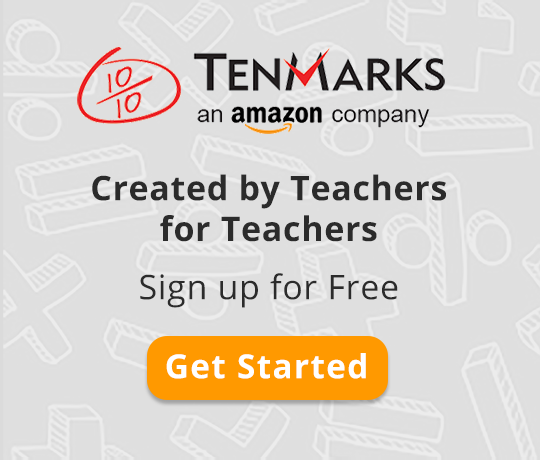 In fact, TenMarks Math has been independently reviewed by Learning List and deemed 100% aligned to the CCSS for Grades 1-Algebra 1 and over 95% aligned for Geometry and Algebra 2. This includes items for assignments, assessments, and instruction that teachers can use in their daily lessons to teach the standards and ensure student mastery. 2. TenMarks Math empowers teachers to meet every student’s needs. TenMarks Math is not an autopilot program that replaces the teacher. Rather, TenMarks Math puts teachers at the center, providing them with actionable insights and powerful one-click recommendations to differentiate and meet the needs of every student. Teachers are supported in efforts to reach each student with hints, videos, closed captioning, and real-time tutorials. For ELL Spanish-speaking students, teachers can select a Spanish language experience for the Common Core and Texas curricula. 3. TenMarks Math is committed to developing equitable content so that all students can succeed. Students can access TenMarks Math content and demonstrate their knowledge in multiple formats. For example, TenMarks lessons present information using a variety of media, including graphics and animations. When working on TenMarks Math assignments, students can access both text-based hints and video-based explanations. TenMarks Math reduces barriers to achievement by providing students with multiple accommodations and supports. For example, students work at their own pace through personal work and assignments, assessments feature text-to-speech capabilities, and video content is closed-captioned. Learn more about TenMarks Math by visiting TenMarks.com. 1 Meyer, A.R. & Gordon, D. (2014). Universal design for learning: Theory and Practice. Wakefield, MA: CAST Professional Publishing. See http://www.udlcenter.org/research/researchevidence for an extensive listing of research-based evidence relating to UDL. 2 As of the 2013-14 school year, nearly 5 million students in public elementary and secondary schools in the United States -- over 10% of total enrollment -- are classified as English Language Learners. Of those, nearly 77% claim Spanish as their home language Source: 2015 Digest of Education Statistics, Table 204.27. U.S. Department of Education, National Center for Education Statistics. Retrieved from https://nces.ed.gov/programs/digest/d15/tables/dt15_204.27.asp.